So is there anything new for Nora Roberts to write in terms of her magical/paranormal trilogies? I didn't think so, therefore I began Stars of Fortune with a little trepidation. However it wasn't too long before I found myself swept away into the story that begins the Guardians Trilogy. I love the cover of the book, the setting is Corfu in Greece. Picture the blues and whites and Mediterranean sea, the olive groves. Perfect setting, loved it. There are six characters, all on a quest to find the three stars before the evil god witch Nerezza does. Sasha is an artist and seer. In the beginning she is a bit of a recluse, not fully trusting of her gift. Physically weaker than the others. She arrives in Greece and then slowly they all begin to link up until there is a team. Yes Sasha and Bran are the main couple in this book, but they all must work as a team, and trust each other. And that trust is not readily given. Sasha though is determined to see unity and speaks her mind forcefully on the matter at times. Bran is a magician, with a place in New York and Ireland. He is a magician on many levels. Then there are Riley - the archaeologist, and Annika - a gentle beautiful mystery, who are the other two women. As a reader we aren't let into their secrets straight away, although a few clues are strewn along the way. The other men - Sawyer a wanderer and Doyle a fighter do not release their secrets early - and nor did I find any clues along the way as to exactly what they are. Let's just say - freakin' awesome. The six must work together on a quest and find the stars. As well they must deal with whatever Nerezza the god witch throws at them. Be it black and evil, be it sneaky and cruel. She is the dark and they the light. She has minions who do her bidding and aid her in her evil quest for power and destruction. I am looking forward to the next two in this trilogy very much. 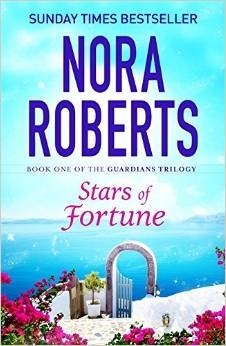 Sasha and Bran made a delightful couple, but how Nora Roberts is going to match up the others - each with some very strange gifts, I am just not sure how that is going to be achieved. Maybe magic - anything can happen of course in the realm of fantasy! She puts out a lot of books! I haven't read any in quite awhile, but I really need to. This looks like a really good start to the series. It's been so long since I've read a Nora Roberts book. She used to be one of my top favorites. I do want to get back to read them. I'm glad this trilogy started off well and she doesn't reveal much else. The last trilogy, I totally enjoyed the first two and by the time I got to the third, the couple's angst was beaten to death. So I'm curious to see what you say about the second. I don't think I have ever read one of her books...yet! I definitely need to start this series...as soon as I finish the Cousins O'Dwyer Trilogy!